Perceptive satire focusing on race relations as seen through the eyes of 4 black students at a fictional Ivy league college. African American students are a distinct minority at Winchester University but that doesn’t mean they don’t have a voice. Enter Sam White (Tessa Thompson) a deejay at the campus radio station and host of the popular program “Dear White People”. Her inflammatory rhetoric infused with humorous observations informs as it entertains with witty aphorisms like the following: “Dear White People, please stop touching my hair. Does this look like a petting zoo to you?“ She runs for head of house railing against a Housing Act that would force African American residence hall Armstrong/Parker to diversify. The incumbent is Troy Fairbanks (Brandon P Bell), her ex-boyfriend. He is the good looking wealthy son of the dean. Then there’s fellow undergraduate and video blogger Colandrea Conners (Teyonah Parris). She goes by Coco and leans more toward the white students. And lastly there’s Lionel Higgins (Tyler James Williams), an aspiring journalist who happens to be gay. His love of Robert Altman films and outdated style are at odds with the rigidly-defined cliques of both the blacks and whites. He doesn’t fit in with either. His socially awkward outcast is perhaps the most fascinating individual of them all. As evidenced by that plot description, the archetypes are not easily defined. They have complicated attitudes with aspirations that change as the movie plays out. You think you have someone pegged, only to have those assumptions subverted. Occasionally the motivations behind a character’s thoughts isn’t entirely clear. While rabble-rousing against the white establishment, Samantha secretly sees white boyfriend Gabe (Justin Dobies) on the side. Colandrea calls herself Coco, wears blue contact lenses and a straight weave. She is embarrassed by her Southside Chicago roots. Yet she portrays the angry black woman on her YouTube channel to gain more followers. She actually makes some of the most trenchant observations in the film. But what drives Coco and how she truly feels is somewhat inconsistent with her behavior. Troy Fairbanks is handsome, athletic and dating the white daughter of the university president. His more conservative beliefs are at odds with Sam, his opponent for head of house. Are these various people behaving the way they do because they’re simply trying to fit in or is it because they do indeed hold those views? It’s a bit ambiguous. But then, in a movie where students are still trying to establish their own identity, perhaps inconsistency is the most consistent trait of all. Director’ Justin Simien has a surprisingly confident voice for a feature debut from a new filmmaker. His multiple protagonist, many layered web of interconnecting stories is Altmanesque. In fact, Lionel Higgins’ love for the maverick director of the 70s makes his role seem autobiographical. Simien articulates a subject for a lot of interesting conversations. What makes Dear White People so affecting is the authenticity of the various personalities in the cast. The script is particularly intelligent as it develops a cast that is both enlightened & foolish, likable & rude, admirable & flawed. They are developed human beings that have nuance and depth. This holds true for the white and black characters alike. It all comes to a head at an ill advised themed party thrown by a white fraternity. Yes the story is ostensibly about racism but it delves deeper. This is a film about students that are conflicted. They’re trying to find themselves. Every so often there are discrepancies in what they may say and what they legitimately believe. When or if it is appropriate to assimilate? And when is it important not to compromise your own identity. It is in the handling of those questions that the movie’s excursion into these thoughtful subjects, truly shines. This entry was posted on November 2, 2014 at 11:00 am and is filed under Comedy, Drama with tags 2014. You can follow any responses to this entry through the RSS 2.0 feed. You can leave a response, or trackback from your own site. There’s a lot going on in Simien’s work to unpack, and it left a lot to think about. Personally, rather than comment directly I choose to point discussions towards critics of color who may be less commonly read, but probably have something more worthwhile to say than I do, like my friend Dom Griffin: http://deadshirt.net/2014/10/21/dark-gable-presents-dear-white-people/ (that’s one). That’s admirable although I wouldn’t sell your own opinion short. The movie is literally addressed to you (and me) after all. it’s like John Singleton’s HIGHER LEARNING but for Millennials. It’s more comedic and not as tragic. It’s proof that Simien is perhaps more hopeful, which is perhaps a sign of the times, but it should be noted that this year marks the 60th anniversary of ‘Brown vs. Board of Education’, the Supreme Court decision that forced the integration of schools, but in this movie there is a character who has a kind of Marcus Garvey attitude about her. Yet, at the same time, she, meaning Sam, has a bit of W.E.B. Du Bois in her too. I feel like this movie also points out the way racism has morphed. Some think it’s gone, but it still reverberates in insidious ways, ways that reverberate within the black community itself and I think this film has been the best expression of that on the big screen that I’ve seen in a while. I think the film is more effective than most movies about this subject because it addresses it in a most unexpected way. Singleton’s Higher Learning is a good reference. Perhaps a little of Spike Lee’s School Daze in there too. P.S. You just inspired me to look up Marcus Garvey and W. E. B. Du Bois. I found this film very interesting. It was very intellectual with different views. I understood each side. I liked that. Do I agree with everything that was said, or done? No. But I’m amazed at some of the things that were done. Cringing. 3 1/2 stars. Yeah that party was pretty messed up. Nice work Mark. Been seeing quite a number of absolute rave reviews for Dear White People, so you’ll have to forgive me for thinking 3.5 is just a bit tepid!! Why is your scale so unforgiving??? Lol. For cereals, I look forward to this one. But I’ll keep my expectations in check I think. 2 ½ stars is tepid. 3 ½ stars is a good review!! But I’m not interested in following the flock anyway. I have to evaluate based on my own opinion. Those lines point out my feelings that the script was a little unfocused and incoherent. 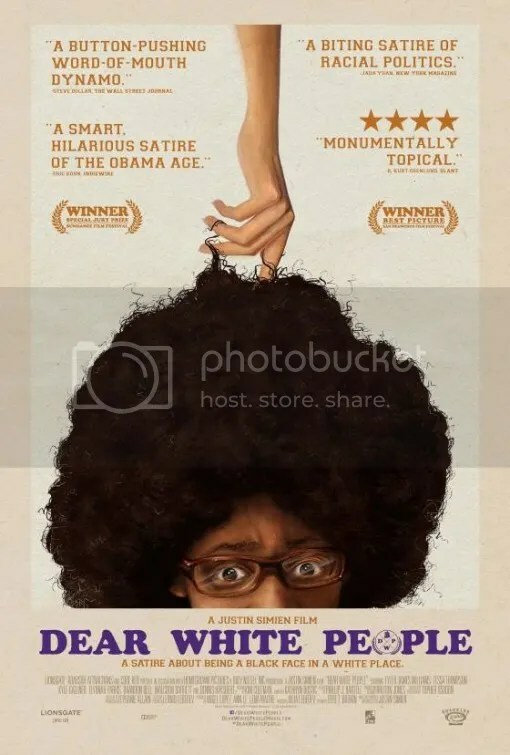 I’ve heard many good things about Dear White People, and after reading your review I’m even more interested in seeing it. From your description it sounds like a nuanced and fascinating look at race with characters that are more than just simple archetypes. It’s an undiscovered gem. Hopefully people will discover it on video.